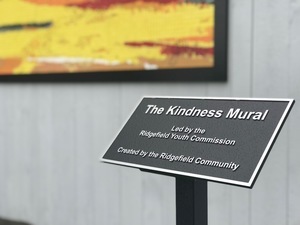 Ridgefield celebrated kindness today with the unveiling of our town-created Kindness Mural, a project that spanned one year and brought locals together in the name of inclusion and love. At the center of the project was the Ridgefield Youth Commission (RYC) and their Chairperson, Denise Qualey. 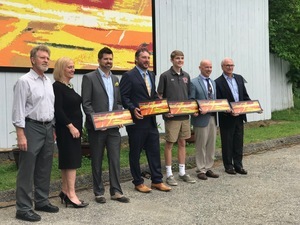 Joanne and Bruce Hunter, who own the Danbury’s Art Spot worked with dozens of Ridgefield community members to help create this colorful mosaic mural that hangs on the Governor Street Barn, in the heart of Ridgefield. 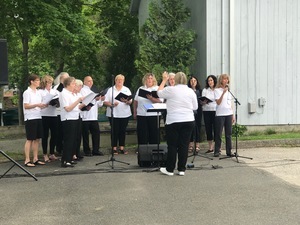 The Ridgefield Chorale provided beautiful music and speakers, including First Selectman, Rudy Marconi; Scotts Ridge Middle School principal, Tim Salem; Boys and Girls Club of Ridgefield Executive Director, Mike Flynn and Youth of the Year Chris Cozens, and Jason Cianciotto, Executive Director of the Tyler Clementi Foundation, reminded attendees that kindness can change lives. Today was a shining example of how one community is making the world a better place. “Ridgefield is family,” First Selectman Rudy Marconi remarked. We are blessed to be part of such a remarkable family. Thank you to Denise Qualey and to the RYC for your hard work and dedication to this project.